Calibration (noun) - The act of checking or adjusting (by comparison with a standard) the accuracy of a measuring instrument. All the mystery revealed. Calibration is checking the accuracy of one parameter (ie voltage) against a known standard. To do this NIS have calibration standards which have a greater accuracy of measurement than the test equipment we are calibrating. If the instrument is a long way out of calibration i.e. it should read 100V but is actually reading 127V then there are various different ways of making the reading say 100V, commonly by changing calibration points inside the instrument. This obviously doesn't only apply to voltage, but to all the variables even through to compression tooling which will stop crimping when a certain pressure on the jaws is reached. 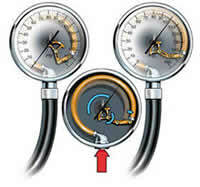 This pressure release point is determined by checking the compression tool against a NIS standard.